These are all fans. Some prettier than others or fancier than others. But they are all fans and all get the job done. 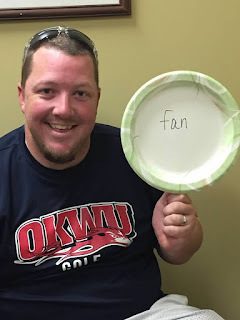 When I think back on August 27th, 2015 what I remember is a fan, this fan. Just a simple plate and tongue depressor taped together. The creator even went one step further and wrote “fan” on it to make sure everyone knew what it was. Sometimes in life we get handed a life isn’t as pretty or fancy as we thought or dreamed. But then sometimes when we stop to take a good look at our life, it is still a life we love, a life we dreamed of. We were at the lab to have my blood drawn for the MaterniT21 test to test for Down syndrome when I found this fan. TJ and I loved it and it diffused the situation. In fact we found ourselves taking a picture of it. I still remember TJ using it to fan the nurse who was having a hot flash while she drew my blood. This all happening while I worked hard to not think or even consider the possibility of what they were checking for. I wanted to think and focus on the “pretty” life that I dreamed and envisioned. I was about to learn a new perspective. I was about to learn that my life might look different from what I had expected but it was a life worth having. It was a life richer than I could have ever imagined. Yes, it would include difficulties that I didn’t realize I would face as I advocated for my child. But I also soon learned that I was proud of my fan/life. Just like the creator who wrote “fan,” I might even have to write “happy family” or “same.” Some don’t believe it or recognize it for what it is, they don’t know any better and just see different. When in actuality our family and our “normal” resembles that of many families. Two boys with their own unique personalities, strengths, weaknesses, and likes. In many ways I did get the life I dreamed of just with a little bit of a different look. My life isn’t any better than yours, but yours isn’t any better than mine either.